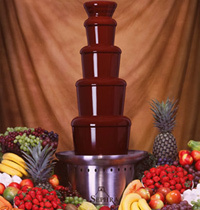 Pictured: The Sephra 44 inch chocolate fountain, item CF44HP. The Sephra line of chocolate and fondue fountains are the ultimate accessory for every catering hall, dessert restaurant, fondue lover and home entertainer. From the oversized 44” fountains to the home 19” chocolate fountains, these chocolate & fondue fountains will serve as the perfect topper for any party or special occasion. Fountains offer endless entertainment with fruits and desserts to dip in a cascading curtain of warm melted fondue chocolate.